There are plenty of incredible Cube Puzzles. Depending on your preferences, you can may decide to buy a classical 3×3 Rubik’s Cube or maybe different sizes of this puzzle (2×2, 4×4 or 5×5 Rubik’s Cubes). If 6-sides puzzles are not enough for you, you can try to solve Megaminx puzzles (12-sides), or try different variations of the Rubik’s Cube. If you like speedcubing, we will show you which is the best Rubik’s Cube, and also which lubricants you can use to speed your cube. And, if you want it, you can buy a timer to check your resolution times. 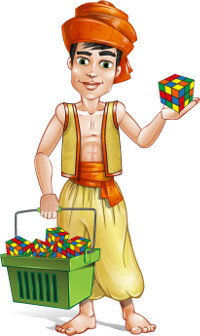 The best online shop to buy Cube Puzzles is LighTake. It has the best prices and it’s totally safe (I have bought there plenty of times). But what I like the most about LighTake is that it always includes free worldwide shipping. It doesn’t matter what you buy, you will have it in your house completely free of charge.